Exploring the ecotone. a place of immense creativity and hope. “Earth’s Flotsam” examines life in transition in the ecotone, a zone where ecosystems intersect leading to explosive biodiversity. Nature’s creativity at the edges is an instructive counterpoint to doom-and-gloom climate scenarios. My cyanotypes record the variable effects of sun and weather, embodying the energy and aliveness of this transition zone. 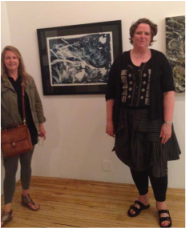 Isobel and artist friend Peggy Cyphers at opening of Shifting Ecologies.